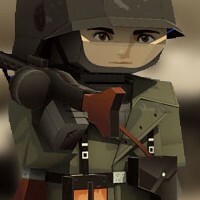 This WWII German machine gunner can be added to the paper soldier collectibles series. With this release, now we have 2 models from WWII era, beside band of modern soldiers and 1 from America British Colonial Era. As the previous WWII Paratrooper from Allied Forces this heavy machine gunner also came from a special force called Panzer Grenadier (Panzergrenadier). Panzergrenadier is a motorized and mechanized infantry. They also have tanks / panzer battalion, trucks and other some type of support vehicles. In the war movie when we see german soldiers were sitting on top a tank, they usually are panzergrenadiers. The template contains 3 pages of patterns. 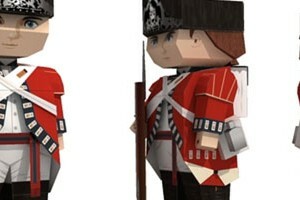 New type of soldier enlisted on Paper-Soldier category, this is The British Grenadier from 18th century, 1763. Actually I already aimed this "Red Coat" soldier to be a paper-soldier for quite a long time. As I remember they appear in The Patriot movie (Mel Gibson) an old movie Zulu, and I believe there are more that I haven't watch yet. Just like their song, there's none compare with a tow, row, row of The British Grenadiers, that red coat frighten their enemy. In their time off course, when camouflage tactic was not invented yet and when cover to shoot was for cowards. I really like their patriotic song, I think it's very encouraging, and it's one of my favorite patriotic military march songs. When I watched Discovery Channel about French Foreign Legion, I thought this might be a nice subject for papersoldier series. 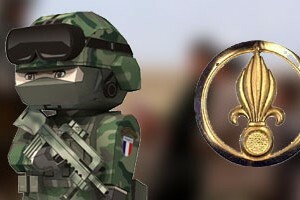 This legion is one of a kind, the only elite force which comprise about 40 nationalities Legion,as a brothers in arms served the Legion, France. They joined the legendary force for honor. The Legion first formed in 1831 by French King Louis Philippe. The paper craft kit include a distinctive Legion's weapon a FAMAS F1. Most of the part of this paper craft are the same as other papersoldier except the weapon. US Navy SEAL Team Six is involved in the most famous operation to date, The Neptune's Spear that killed the number one wanted terrorist fugitive Osama bin Laden on May 1, 2011. The operation took 38 minutes to complete in Abbottabad, Pakistan, successfully complete with no operative casualties. I use many reference sources and combine it together, because there's no picture of the actual SEAL team six operative on the net. 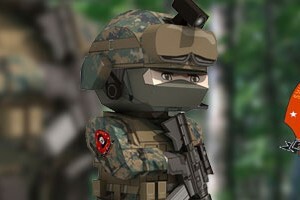 This papercraft is a re-color version from USMC 3rd recon force paper soldier. 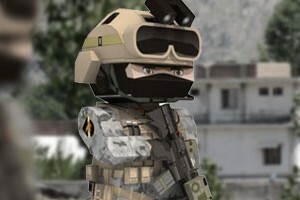 The texture is provided by Dammond, he is a US Army Military Police. Actually he sent me the edited templates in bitmap format (PNG), then I use the official US Marines MARPAT camo texture provided by him in the final vector graphic. Because the parts are exactly the same from 3rd recon, so I use same images for instructions.